UPSEE 2015 Online Application Form - Apply Now UPTU UPSEE 2015 Application Form Download UPSEE UPTU 2015 Online Application Form UPSEE – 2015 for Admission to First Year in B. Tech /B.Arch. / B.Pharm./ BHMCT / BFAD / BFA / MBA / MCA / MAM And 2nd Year in B. Tech./B.Pharm./MCA (Lateral Entry). Candidate may fill application form On-Line through website http://www.uptu.ac.in or http://www.upseeuptu2015.in. 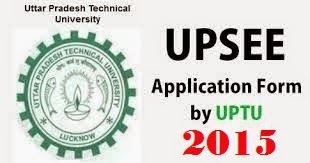 UPSEE 2015 Online Application Form by Uttar Pradesh Technical University (UPTU) is available and UPSEE 2015 Online Application form Last Date 25-March-2015. UPSEE 2015 Online Application Form by Uttar Pradesh Technical University (UPTU) is available and UPSEE 2015 Online Application form Last Date 25-March-2015. UPSEE – 2015 for Admission to First Year in B. Tech /B.Arch. / B.Pharm./ BHMCT / BFAD / BFA / MBA / MCA / MAM And 2nd Year in B. Tech./B.Pharm./MCA (Lateral Entry). Candidate may fill application form On-Line through website http://www.uptu.ac.in or http://www.upseeuptu2015.in. Candidate may also submit application in Off-Line through designated Help Desks (Affiliated Institute of UPTU) for these courses. List of Help Desks (Affiliated Institute of UPTU) is available on the website. This Entrance Examination is open only to the candidates who have passed the qualifying examination from any institution located in U.P. or whose parents are domicile of U.P subject to the eligibility conditions given in this Information Brochure. If the candidate has passed qualifying examination from outside U.P., he/she has to produce domicile certificate of his/her parents (Father OR Mother only) at the time of verification of the document. The candidate has the option to submit his/her application for UPSEE-2015 examination either by On-Line or by Off-Line application form through designated Help Desks (Affiliated Institute of UPTU). The submission of On-Line application form through website can be made from 25th February, 2015 to 25th March, 2015. UPTU UPSEE 2015 Off-Line application form can be filled from 25th February, 2015 to 25th March, 2015 (both days inclusive) at designated Help Desks (Affiliated Institute of UPTU) located in various places in Uttar Pradesh. Candidates are advised to read carefully this information brochure, check their eligibility and applicablereservation category etc. before filling and submitting the application. For filling Off-Line application form through designated Help Desks (Affiliated Institute of UPTU), refer section 17 and 20 of this brochure. For submission of the On-Line application form refer section 18 and 20 of the brochure. For UPSEE 2015 ONLINE application, visit at website. The link for submission of application ONLINE is available from February, 25, 2015 to March 25, 2015. For OFFLINE submission, candidate may contact any of Help-Desks at Institutions of UPTU. For both ONLINE and OFFLINE applications, the confirmation page must reach to the Registrar, UPSEE-2015, Uttar Pradesh Technical University, IET Campus, Sitapur Road, Lucknow 226021 by March 31, 2015 (5.00 PM) by registered/speed post. The Confirmation Page received after the due date or through any other means shall not be accepted. The University will not be responsible for the Confirmation Page missed/ not received / any delay on the part of post office or for any other reason whatsoever. The list of designated HELP-DESK at affiliated Institutions of UPTU will also be available at website. The details of tuition fee for the institutions affiliated to UPTU is available on the website of Fee Fixation Committee www.afrcup.in.